Seed dormancy is a very important trait that maximizes the survival of seed in nature, the control of which can have important repercussions on the yield of many crop species. We have used gene expression profiling to identify genes that are involved in dormancy regulation in Arabidopsis thaliana. RNA was isolated from imbibed dormant (D) and after-ripened (AR) ecotype C24 seeds, and then screened by quantitative RT-PCR (qRT-PCR) for differentially expressed transcription factors (TFs) and other regulatory genes. Out of 2207 genes screened, we have identified 39 that were differentially expressed during the first few hours of imbibition. After analyzing T-DNA insertion mutants for 22 of these genes, two displayed altered dormancy compared with the wild type. These mutants are affected in genes that encode a RING finger and an HDZip protein. The first, named DESPIERTO, is involved in ABA sensitivity during seed development, regulates the expression of ABI3, and produces a complete loss of dormancy when mutated. The second, the HDZip (ATHB20), is expressed during seed germination in the micropylar endosperm and in the root cap, and increases ABA sensitivity and seed dormancy when mutated. 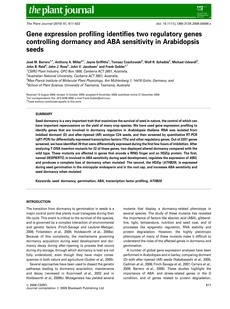 seed dormancy, germination, ABA, transcription factor profiling, ATHB20.